The GIAC (Global Information Assurance Certification) program and digital badging provider Acclaim have partnered to provide our certification holders with a digital badge of their GIAC certification. Digital badges can be used in email signatures, personal web sites, social media sites such as LinkedIn and Twitter, as well as on electronic copies of resumes. Digital badges help GIAC certification holders convey to employers, potential employers and interested parties the skills required to earn and maintain a specialized GIAC certification. This is what a GIAC digital badge looks like when you add it to your web site or email signature. There is personalized metadata included with GIAC badge logos, which tie the badge to your personal certification achievement. Digital badges are online representations of your achievements. GIAC's digital badges provide our certification holders increased value by enabling interested parties to view and learn more about the credentials you hold with a single-click. When someone (such as manager or human resource staff) clicks on your badge, they will be directed to an overview page providing them metadata on your qualifications and specialized skills, as well as the process you completed to earn and maintain the credential. This additional layer of content helps you more fully explain your capabilities and high level achievements. With over 30+ specialized and highly-technical cybersecurity certifications, it has become imperative to provide non-technical members within our industry a resource to easily understand the skills and abilities associated with your GIAC certification(s). GIAC has worked with Acclaim to develop this digital badge program to help solve a problem many of our certification holders have expressed to us - "lots of HR and management professionals do not understand the specialized skills and abilities I have, or how to verify them." Your adoption of the GIAC digital badge program will help increase the awareness of our specialized cybersecurity certifications, and more importantly how they differentiate you from other security professionals, which will greatly enhance the value of being GIAC CERTIFIED! After you have earned your GIAC certification, you will be contacted via email with instructions regarding claiming your digital badge. To facilitate timely delivery of all notices pertaining to this program, please whitelist the email addresses DigitalBadges@giac.org and Acclaim's no-reply@youracclaim.com. The security of your personal information has been at the forefront of our work with Acclaim and we will continue to ensure the protection of your data. If you have any questions, please email digitalbadges@giac.org or visit the F.A.Q. portion of this page for more information. A Digital badge is an online representation of an outcome or achievement. Digital badges refer specifically to badges that adhere to an open standard being led by the Mozilla Foundation for recognizing and validating learning. They are secure, web-enabled credentials that contain verified information employers can use to evaluate an individual's qualifications. 2. What is the difference between a GIAC Certification and a GIAC Digital Badge? The GIAC Certification credential is earned only after successfully completing the certification exam with a passing score. Digital badges are a web-enabled, digital representation of that certification, enriched with a standardized set of metadata that verify your achievement. You would be granted the Digital Badge after completion of the certification exam. 3. How is displaying my credential as a Digital Badge useful? Digital badges are online representations of your achievements. GIAC's digital badges provide detailed information about the credentials you hold via a single-click. For instance, an HR manager can click on your badge and will be directed to the badge's page which provides them metadata on your qualifications and the process you completed to earn them. This additional layer of content helps you more fully explain your capabilities and high level achievements. This can be helpful when you are looking for a job or other career advancement, as well as general display of your achievements. 4. How do my certification details get displayed as a Digital Badge? GIAC, as your credential issuer, has partnered with Acclaim to translate certification objectives into the open badges standard defined by Mozilla. 5. Why have I not received emails? Emails for the digital badging program will come from two different addresses: GIAC's DigitalBadges@giac.org and Acclaim's no-reply@youracclaim.com. Please white list these email addresses to ensure smooth delivery of necessary set up and account notices. 6. 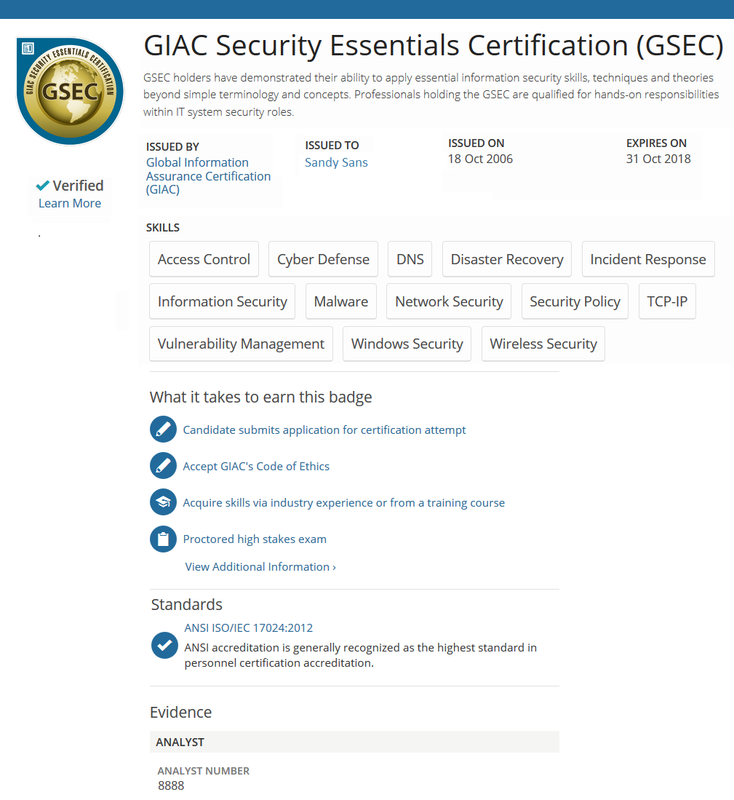 What if I have multiple GIAC certifications; can I claim a badge for each certification? Yes, you will be able to claim an electronic badge for each active GIAC certification you hold. 7. Can I claim a badge if my certification has expired? Acclaim is an independent initiative backed by Pearson, the world's leading learning company. Its focal point is an enterprise-class badging platform built in compliance with Mozilla's open badges standards to support the specialized needs of credential issuers, employers, and professionals. The Acclaim web platform provides a secure means of storage, transport and credential publishing that adds a layer of protection against those who may falsely claim high-stakes credentials. 9. What is the relationship between GIAC and Acclaim? GIAC has entered into a vendor relationship with Acclaim to implement a program for web-enabled credentials displayed as digital badges. Acclaim is the web site from which you claim (accept), store and transmit open badges related to your credentials. It is also where those looking to verify your certifications go to view them. 10. What if I do not want my credential to be public? If you do not want your certification or your profile to be visible to the public, you can make them private. In fact, you may simply discard the digital badge email if you do not wish to participate in the program. GIAC and Acclaim take very seriously the importance of putting you in control of your certification. All information regarding you and your certification can be configured within the Acclaim system. 11. Is there a fee for claiming and displaying my badge? No. Storing, managing and broadcasting credentials is free for GIAC certification holders. 12. What is to keep someone from copying my badge and using it? While digital badges are simply image files, they are uniquely linked to data hosted on the Acclaim platform. This constant link to verified data makes them that much more reliable and secure than a traditional paper-based credential. 13. Can I include open badges on my resume or LinkedIn profile? Absolutely! Every digital badge and profile on the Acclaim platform has a unique URL that can be embedded on a resume or web site. We also offer seamless integration with the most popular social and professional networking platforms for the display of credentials as digital badges. LinkedIn enables the earner to permanently display the achievement within their profile with single click verification. In order to display your badge on your LinkedIn profile, log in to Acclaim, select the badge you would like displayed on LinkedIn and then select share. The site will then walk you through connecting to LinkedIn and a series of confirmation steps. Please note that when a certification is referenced in a LinkedIn profile, an image of the GIAC logo is displayed online, not the actual badge image. 14. Who should I contact if there are issues with my GIAC badge? 15. When will I get my badge? 16. Can my badge be added to my email signature? Yes! The exact process is slightly different for various email clients and operating systems. Below you will find a link to a video with a basic explanation on how to do this using Gmail. Regardless of your email platform the process is basically the same. 17. Why must I approve social media sites to post on my behalf? The user (you) has to give the permission for the bridge between the social media site and Acclaim to exist, but at no time will Acclaim post without an action being initiated by the user. Any activity taken on a user's behalf must first be initiated by them, otherwise the social platform will turn off Acclaim's access. Acclaim will never do anything beyond post a badge for a user (after it is requested) but social media sites only provide these standard permission screens and do not allow only specific actions to be omitted. If you are still not comfortable establishing this link, we certainly understand. You can still share your badge and accomplishment by using the public URL and positing right into your social media account as a status update or tweet. 18. How can I combine two Acclaim accounts? Yes, if you have two Acclaim accounts using different emails, you may combine them using the following directions. Log into the master account (the one you want to keep) on youracclaim.com. The email addresses from the account that was merged into the master account will be added as a secondary email to the master account.